Personalized ribbon ties around wedding favour cake box, adds that personal touch, and a memory of the event. used to personalized wedding favors. I purchased this ribbon for my wedding favors and it was just perfect. All of my guests were really impressed by the way I used it and they loved the color combination. I was very happy and pleased with my purchase and should I have need to will definitely order it again. My favors were a great hit because of this ribbon it made them look elegant,sleek and classy. And it was very easy to work with. Two thumbs up...:p)!! I ordered this ribbon to use on my bucket wedding favors. I used the ribbon as the handle. The spacing between the words was a little bit long but it still looks great and the ribbon is a good quality and doesn't fray much at the cuts. It looks great. Can't beat the price for the amount of personalized ribbon you get. I was very pleased with the ribbon. It added a nice touch to the gift at the table and bubbles. I am using the ribbons to wrap the small paper chest I purchased from Beau-Coup as well. The foil like print looks great on the ribbon, and I got the colors I wanted! Perfect ribbon for my wedding favors! The ribbon will be used to tie my wedding favors and they look just perfect! I recommend to everyone who loves small details on an event. I ordered the personalized ribbon to wrap the party favors for my daughter's bridal shower. Everything was great except for the personalization. I feel like the font should have been either larger or bolder. We ordered these for my sister and brother-in-law's baby shower as favors. Great gifts, elegant and stylish. Ribbon that was receied was exactly what was ordered. Thank you. Worked out perfectly for the shower gifts. Easy to order, always timely and correct. I had "Jonathan & Elizabeth Oct. 8, 2011" written on my pink ribbon and used it to wrap around individual boxes that held a cupcake for everyone at my wedding shower. The ribbon was simple & classy. 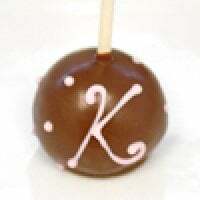 I will use this to personalize favors at my wedding this summer. It was a bit much money to spend, but in the end, it is worth it bc it personalizes the favors in such a unique way. The ribbon is beautiful - the color is exactly what i expected and the personalization is very nice. I am using the ribbon to tie candy bags for my wedding - i think they will look great! Will add a great little touch! The soon to be "Mrs. Bell"
I'm making garters for the girls in our wedding party and I wanted them to be keepsakes showing our names and wedding date. These ribbons are perfect, and the ribbon color even matches the dresses! What you see is what you get ! No less. Used these for my bridal shower. Yes its hard to trust online purchases at times, but I fully reassure you that you can sit at home and get things done with Beaucoup! I was very happy with the quality. It was just perfect !!! This brown ribbon with golden letters made the perfect match for the wedding favors !!! Great for that extra touch! We used this ribbon to hang our favors on a tree for our guests to take. Just that extra touch to make it ours. I ordered white ribbon with silver print for a wedding event. The silver was a bit too light on the white and I wish it would've had better contrast. I would definitely order this product again but I would pay more attention to the color combination I chose to get more contrast. It is gorgeous ribbon and high quality print. Ends do not fray like some cheaper ribbons. the perfect wedding favor RIBBON!! The ribbon arrived quickly and was just gorgeous! The chocolate brown ribbon is very deep and the gold writing makes a very stunning contrast. Spacing is nice and the script font is VERY elegant. Customer service EASILY helped me to order an extra roll after the first one! Have not found anything of this type of website anywhere on the internet and I have searched the internet for for numberous wedding items. Make sure that you are sent the right amount of boxes if you order the favor boxes. We received way too many lids and not enough boxes. Check your order carefully. Neat website with many unusual items. I used this product for tying wedding favor boxes. Great accent and gave a personalized touch. The only down side is the ink will rub off, so be careful tying. The ribbon was sent out very quickly and looked beautiful! We used this to tie on favors at my friend's bridal shower. We ordered it relatively last minute and it was beautiful! Some of the text has faded with time, but the day of it was exquisite! the ribbon was not only attractive but was very easy to use. it bowed beautifully. we used them at my daughter's bridal shower to tie around cook books which we gave as favors. my guests said they saved them after untying to use as book marks in the books. a double memory. The ribbon was of excellent quality. THe ribbon added that extra touch of personalization and elegance to my hat boxes. I loved this ribbon. I used it for my daughter's bridal shower, which I had at a tea room. I tied them in a bow, on the handle of a white tea caddy. I used the chocolate ribbon, with sage green lettering. Everyone loved them! The only thing I wish I knew ahead of time was how much ribbon each one took, to get their name to appear on the one side of the bow, and their wedding date on the other. I found out it took about 14 inches. If I would have had that measurement ahead of time, I would have been able to figure out exactly how much ribbon to order. Instead, I just guessed, and was short for 5 of my favors. I just bought some cheap thin brown and green ribbon then, to do those, because another order would not have come in in time. A nice touch to add in the celebration. Excellent quality product and everyone commented about it. The ribbons were gorgeous & I can't wait to use them to decorate the favors for my parents 25th Anniversary! The Pink & Silver and the Pink & Black combinations look great! The color is perfect...matches the invitation. Will be perfect to tie bags of favors. This Mother-of-the-Bride loved the beautiful ribbon for the shower favors! And the service was nothing short of perfect! Great product easy to do and a lot of great choices. I would and will buy this product again! I used this product to create sand dollar ornaments for my wedding favors. My wedding colors are brown and blue and this was the only place that I could find light blue ribbon with brown font! I used this ribbon to tie it around our favors. It was usefull compared to the first batch I purchased at the store (which was too small). The great thing about this is that you can make it as long as you want, no restrictions! The small little con is that if you pull on the ribbon too much, the print starts fading away a bit. We are using this ribbon to wrap bridesmaid/groomsmen appreciation gifts - a perfect personal touch! We did not put the date of the ribbon so any leftovers can be used for wrapping gifts special from the two of us throughout the year. I bought this product for my sister as part of her wedding gift. [...] how beautiful it was. I will definitely purchase products again. Thank you. Plan to use the ribbon for wedding favors. Ribbons are beautiful, had colors I needed. I am trully satisfied with this purchasing. The products are great and good value. It will certanly add elegance to our weeding. The internet shop works great, fast response and very care with packing and costumer satisfaction. Good quality and it added a nice personal touch to my favors. Used the ribbon to wrap around boxes. Thanks to the reviews we were warned about lettering coming off so we were careful not to touch it while wrapping. As long as you are careful you'll be fine. Wish there were more choices of font styles. Beautiful way to add a customized touch! Great product, ordered the ribbons at the last minute, [...] I was so thrilled! They added a beautiful, customized touch to our wedding party gifts! The lettering does smudge a little if you handle it too much. This ribbon will compliment my treasure chest cake boxes. My son's weding is coming soon and I order this ribon to complement the little goody bags they look precious. I tied the white rectangular boxes with the black personalized ribbon. Truffles were in each box. Beautiful presentation and very special. Tied this in a bow around christmas ornaments and hung them on a tree at our son's wedding reception - let everyone choose their own to take home - everyone commented on what a beautiful personalized favor it was. The personlized ribbon was an elegant, surprising touch to the bride to be. The ribbon was used as bows on the favors (very easy to cut & tie) I ordered (2) rolls, having enough to wrap her shower gift as well as enough to tie around the toast glasses at the brunch that was given after the wedding. 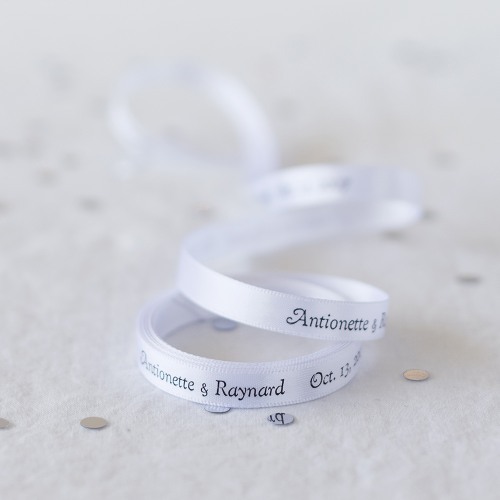 If you want quality, elegance and "one of a kind" order your personalized ribbon with the bride & grooms name with the wedding date, everyone notices the special "little things" especially the happy couple! This was a beautiful addition for my daughters wedding favors..
We bound the wedding programs and menu cards with the ribbon. It was great and everyone loved it. We also tied ribbons around white cow bells for the wedding attendees to ring when the bride and groom exited the church. The only problem we had were the names rubbed off (just slightly) the ribbon as worked it through the programs. Everyone could still see their names, though. I would definitely use this again! My mom wanted to get this at first but once we received the ribbon I was impressed. I used the ribbon at our son's wedding dinner. It was a beautiful accent to the tables, it was exactly what I wanted, it came in a timely manner so I could have time to do with it what I wanted and it was good quality. I will buy this again for sure! This product was great, we used it to tie our favor bags together for the wedding. The color was perfect, accurate and worked with our overall vision for the wedding very well. We were very pleased! I used the personalized ribbons to close traditional French candy given to guests at weddings and baptisms. The Ribbon is elegant and allows you to add a personal touch for a reasonable price. You just need to be careful when touching the writing, as the letters rub off quite easily. All in all, a nice way to do a little something special for your guests! Q:How many yards are needed for 200 favor boxes that are the 2 x 2 size favor boxes? A:To tie 200 boxes with this ribbon, you would need 167 yards if you are tying all 4 sides. If you are tying only 2 sides of the box then you would need 123 yards. Q:How much ribbon do I need to cover each side of 30 3x3x3 boxes? A:You would need a 50 yard roll of ribbon. 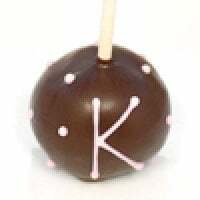 Q:I need to tie 40 small bags with one 6 inch cookie in each for a bridal shower. How many yards of ribbon will I need for 40 favors to be tied? Thanks! A:It normally takes 6-8 inches to tie a bow around a favor bag. 1 15-yard roll should be more than enough for 40 favor bags to be tied. Q:Can you increase the space in between prints to more than 3" apart? A:This is a continuous printed roll. We are unable to space them more than 3" apart. There are only a few centimeters between the printed text. Q:How many individual ribbons do you get in a yard? A:The ribbon is printed on a continuous roll. Your personalized text is printed hundreds of times depending on the yards you select. Q:Can you write more than 34 characters in the text? Just 8-10 more spaces? A:34 is the limit. That includes text and spaces. Q:I would like to purchase the personalized ribbon for my wedding to tie on some bells to have at the church for each guest. Our colors are persimmon and blush pink and I would like it to match a bit if possible. I was thinking the mauve ribbon with white lettering but I'm not sure if A) that will look good or b) if that combination will be legible... What are your suggestions? 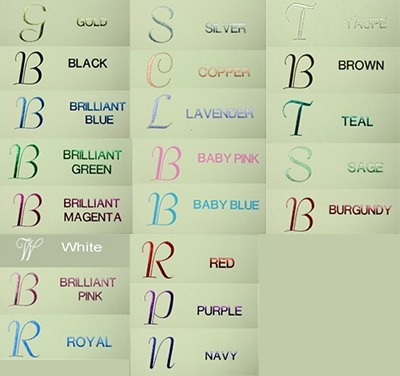 A:For light colored ribbons we recommend darker print colors so that the personalization is legible. Q:Is this ribbon washable? Can I sew it on to a garment? A:The ribbon is not washable. We do not recommend sewing the ribbon. 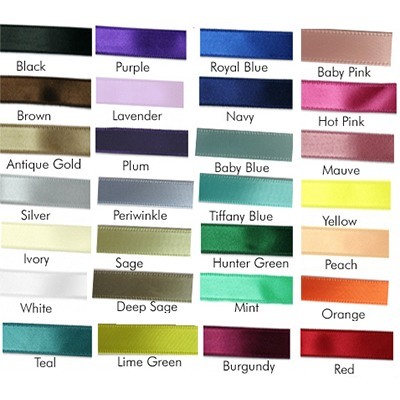 Ribbon samples available upon request. Please contact customer service by phone 877-988-2328 or email info@beau-coup.com. Dress up any favor or gift with personalized satin ribbon printed with your names and event date or a message of thanks to show that you paid attention to even the finest detail. Whether the occasion is a wedding or bridal shower, personalized ribbon can be used to embellish favor boxes, favor bags or other favors packaging. 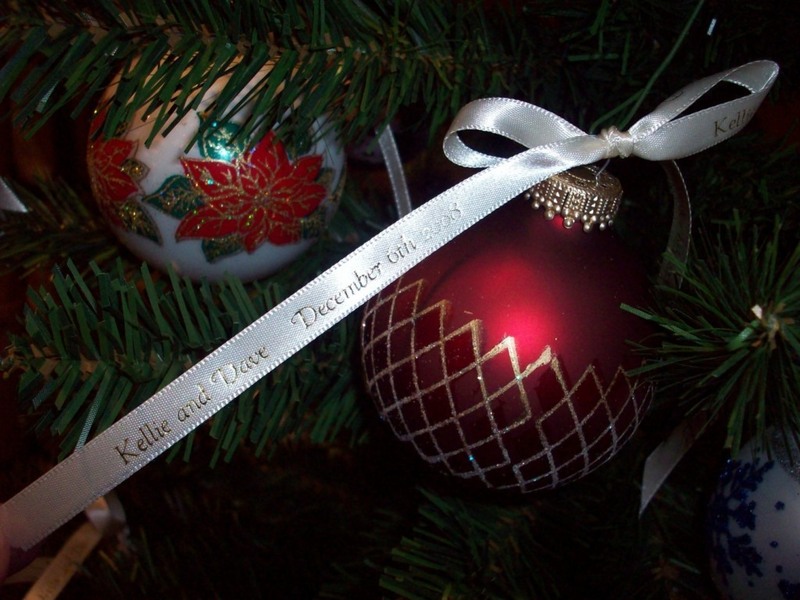 Our personalized ribbon is double-faced satin and comes in 3/8" width or 5/8" width. Choose a ribbon color and print color to complement your color scheme. Personalized text can be up to 34 characters max (including spaces). Ribbon is printed with 2"-3" of space in between prints (a single print is defined as the entire length of your custom text). Unfortunately we are unable to print lettering with accent marks. Check out personalized favor ribbon with printed text on the ends of the ribbon only perfect for tying bows around skinny favors such as tea infusers or handles on mini pails.